I read in the local newspaper that ancient artefacts dating back over two thousand years had been found in the silt at the bottom of the River Wey near a local beauty spot Thundry Meadows. The area around Thundry Meadows is a known ancient sacred site, dedicated to the god Thor, with many place names, such as Thursley, referring back to the god of thunder. For many months I visited and researched the location, all the time imagining what it would have been like to live there two thousand years ago, and making notes on how the landscape had changed. I didn’t particularly have a story in mind when I started, yet my imagination gave me a constant companion, a young man of thirty who’d been born at Thundry Meadows, the son of a tribal chief. This man didn’t want to leave his sacred ground, and he kept talking to me as if he were still alive – so I decided that he was, and made him immortal. During my walks around Thundry Meadows my imagination gave me a companion, a young man of thirty who’d lived there over two thousand years ago. At times I wondered if this handsome son of a tribal leader was in fact a spirit and not my imagination at all, because at time he felt very real to me. He told me his life story, and of how the landscape had changed, yet he never appeared to have ventured very far from his native sacred site. It was as if he lingered and refused to give up his birthright. I wondered what such a man would make of life today, and how he’d cope in the modern world. The more I thought about him, the more compelled I felt to tell his story, seeing him as an immortal, born two thousand years ago yet still living today. 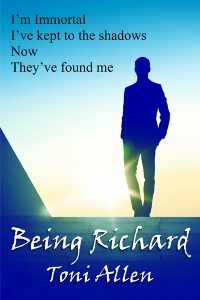 All he needed was to take on someone else’s identity, to ensure he existed on the system for things like tax and a driving license, and that’s when I realised that being Richard was never going to be easy for him. The little ones were always easy to spot. A vigil of small black headstones, tucked away at the back of the cemetery, their teddies and trains weather beaten; the gold faded. Twilight and rain drops shrouded them in pathos, but come dusk the solar lights would flicker on, permanent candles used as protective sprites to ward demons away from these precious spirits. Such short lives, their pasts a heartbeat in time, their names etched in granite to live on forever. If I was lucky and could find someone suitable I would be able to help him live on far longer than his grieving parents ever imagined. I wasn’t interested in the girls; and knew to avoid the ones with cherubs and angels. It was also best to avoid the ones with recent gifts. Steven Johnson may well have passed over in 1975, but the plastic Christmas tree; that would have endlessly chimed out silent night until its batteries ran down, warned that someone still cared, and cherished him. A train rumbled past, heading south out of Ash Station having dumped its weary commuters back to Surrey. They would dice with the barriers and tail back of irritated drivers, all walk home fast to be away from the wind and threat of further rain. Their perfume and after-shave hitched a ride on the wind and dropped its heady scent on the wet grass. I could envisage the women click clacking past men in suits, high heels dodging puddles as they strained their backs to stay proud and upright while carrying heavy briefcases in the pursuit of equality. The men would duck their heads down and plough on, up the road and past the front of the church, searching for a key to a front door, and home, and comfort. I turned back to my task and spotted Richard Ridley; wondered if he was a good enough contender for my attention. Born in 1979 he’d died three months later, much loved and missed by his devoted parents; who could only afford stone and not tough granite. I crouched to read the inscription. Lichen painted it green and although he was age appropriate I didn’t feel like sharing my life with someone that sad. It felt sad. He felt sad. Not that I was sad, that was an emotion I’d long since learnt to set aside. No, the boy had no history, no love, no – I sighed and jotted down his details. He was perfect. When the birth certificate arrived a week later I savoured the opening by sitting outside under the apple tree with a mug of coffee. I enjoyed this type of ritual, the peace and quiet of birdsong, a single candle in a glass jar on the rickety table, and the bright morning sunshine dappling patterns through the leaves. The wooden chair was damp and wetted through my trousers, but that didn’t matter. The piece of paper inside the envelope was what mattered. Leaning my elbows on the table I spun the A5 envelope round and round between my fingers, thinking. I knew I wasn’t going to like him before I’d even opened it, but it was just one of those things I had to get used to living with. My coffee was getting cold so I drank half of it before easing open the envelope and reading the document. Perhaps I had misjudged poor Richard. His father had been one David Ridley, salesman. Now how vague was that? What kind of salesman? Cars? Insurance? His mother had been Elizabeth Ridley, nee Wilkinson, housewife, which meant that David had achieved enough prosperity through sales for his wife not to have to work. On the surface they appeared to be nice, respectable people, but I’d learnt never to accept life at face value. Oh, how I wish I had. Mistrust, and more than a little curiosity, egged me to go against my better judgement and do what I had always promised myself not to do. I went to look at their house. Before going I spent some time online researching what I could of Richard’s family tree. It was always difficult investigating living people, and generally drew a blank; so I was shocked to discover that Elizabeth, or Lizzie as she liked to be known, had died less than a year after Richard. The how of her departure from this mortal plane bothered me, so I ordered a death certificate. Father David might still be alive, and that bothered me too. People survived longer and longer these days, so I guessed he might be in his mid to late fifties by now, which was really no age at all. They had lived a short distance from St Peter’s in Ash, so I parked my Land Rover opposite the church and walked up the road and across the railway line. It wasn’t very far, but by the time I stood outside the house street lights were already coming on and curtains being closed against another damp evening. Something about the stillness of the place made me shiver. I turned my collar up and tried not to look as if I was staring into the abandoned cottage. At one time it might have been pretty, those straggly roses around the door abundant with fragrant blooms, only now it appeared deserted, the wrought iron gate rusted on broken hinges. I really don’t need to know this, I told myself, and turned to walk away. A light flashing on in one of the small top windows made me glance up, but it went out as soon as my head shifted. Was I being watched? For a moment I stared up at the glass and half imagined that I saw a shape move beyond the reflected tungsten of the street light. Land registry, check out who owns the place; get your facts straight. I made a mental note to follow it up as soon as I got back. Head down, I went to join the bright lights and throng of commuters spilling out of Ash station. There was little point in hurrying to move my car, the traffic being jammed and slow moving, so I broke another rule and went to amuse myself by saying hello to Richard Ridley again before going home.